The speed at which armies move around the landscape is a crucial factor in their supply demands and the methods that can be used to deliver those demands. Fast moving forces can draw supplies from the local area through which they pass without exhausting them, however in turn, this presents an obstacle to the setting up of formal supply routes with horse-drawn armies, as the replenishment convoys do not possess sufficient margin of speed to overtake them. The optimum solution for the use of supply transport is to accompany the army as a rolling magazine which can be replenished as the army passes magazines, depots or market towns. The tempo of operations, the speed at which armies march in the operational area, the number of sieges and number of skirmishes and major battles has an influence on the supply demand, the number of replacement soldiers, horses and equipment, the numbers of sick and wounded, the level of rations and supplies that need to be provided, either because it is stationary or moving too quickly for extended periods to forage effectively. During the Thirty Years War armies lived by a combination of plunder and from supplies delivered by river, which both determined their routes of advance and forced them to keep moving from camp to camp as the local area became denuded of supplies. Although the armed forces of the countries involved were quite large upwards of 200,000 men, the individual armies were relatively small up to 35,000 men which allowed them to subsist from the local economy until was devastated by the soldiers. The second half of the seventeenth century saw a move towards a different supply method, one that relied on a greater proportion of delivered supplies. Yet this was a period, the wars of Louis XIV, that Perjes states, produced a 'crisis in strategy' as governments sent large armies of up to 100,000, into the field which moved too slowly to produce a strategic decision. In the 180 days of campaign season, gathering troops from cantonments and bringing them into position lost 80 days, the issuing of bread every four days cost 25 days, a days rest every week cost 16 days, the building of ovens and moving magazines forward another 30, which barely left 30 days available for marching forward at a rate of 20 km a day, giving an operational range of just 600 km. Insufficient to time to allow an army to march into enemy territory, defeat its army and capture its capital. In contrast to this argument, Van Creveld proposes that armies could march freely living off the local agricultural economy, it was their need to reduce fortresses by siege warfare that drove their need for magazine supply while they sat for weeks in the trenches outside the enceinte of some minor town. Which begs the question, what was the tempo of operations and how did it change over the period? An early attempt to collect data on this subject can be found in "A system of camp-discipline, military honours, garrison-duty, and other regulations for the land forces, collected by a gentleman of the army." written by Brigadier Richard Kane around 1757 which has a table showing the days marched, distance travelled and the days spent in camp for the British Army during the War of the Spanish Succession 1702-1712. It covers the approach march to the theatre in 1701 and then 10 years worth of campaigning, giving the size of the army, enemy army, time spent in Garrison (ie. winter quarters), time in Field, March time, distance covered and the start and end of the campaigning year. A typical year starts in the 3rd week of April and the campaign season runs to the 3rd week of October and then round to the start of the next campaigning season. As this is not exactly a calendar year, the "Time" column makes the necessary correction. The Leagues are 3 miles and the miles are English miles of 1,760 yards. What it shows is that the average Garrison was 178 days, average Field 195 days of which 39 days were spent Marching. This represents 20% of the time spent moving with an average distance of 16 km a day. Looking at it slightly differently, that represents 1 day Marching in 5 Field days or 1.4 days Marching per week. In that week the army would travel 22 km or 14 miles. This indicates that armies in the War of Spanish Succession spent the majority of their time stationary, so much so that they would have eaten any country completely bare had they attempted to live off the local agriculture. The rate of advance was so slow that wagon trains would have no difficulty in shuttling back and forth between the army and some distant magazine, as a typical journey by English commercial carriers in 1722 was 32 miles a day by packhorse or 25-29 miles a day by wagon or 192 or 150 miles a week according to Gerhold. This approach be applied to other periods, in order to see change in the tempo of military operations, the main issue is obtaining sufficient good quality data from which to draw conclusions. For the Seven Years War, it is fortunate that we have journal of Horace St. Paul which was published by Gralene Books back in the 1990s and more recently in two parts: From Lobositz to Leuthen and From Olmutz to Torgau which gives a day by day account of the campaigns of 1756-1760 in which St. Paul makes especial note of any marches conducted. Along side this as a comparison, the Die Kriege Friedrichs des Großen gives sufficient detail to get an outline picture of the marching pattern for the Prussian Army opposing them and a good idea of the distances involved. By far the easiest campaign to research from the Napoleonic Wars, is the invasion of Russia in 1812 because there are many accounts detailing the march into Russia and the subsequent retreat. Many of the earlier campaigns did not occupy a full calendar year as the French Army marched into the country and it surrendered with a few months, while the War of Liberation 1813-14 far from straight forward. These sources provide a table of the tempo of operations for each period. Whilst Frederick is much more active than the sedentary Austrians, covering almost twice their overall distance (a good proportion of that is his march from Silesia to Thuringia to defeat the French at Rossbach,) his army does not have a quicker marching speed. Instead the Prussian march 2.4 days a week rather than the Austrian 1.4 days a week. 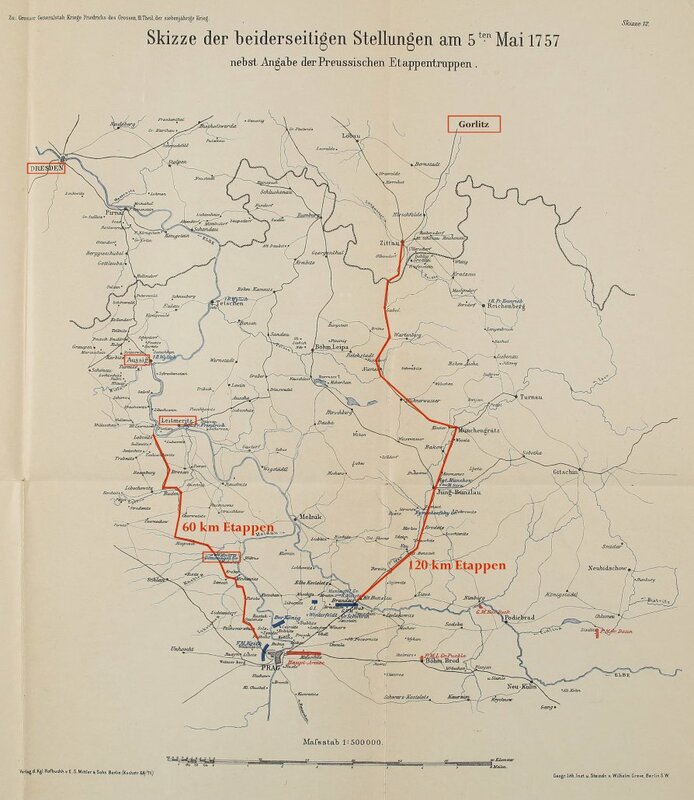 The effect of this, is that the Prussian Royal Army covers 42 km per week rather than the 18 km of the Austrians. Looking in detail at the Royal Army's movements, it conducts 4 or 5 day marches to re-position itself and then spends long periods in camp (26 days facing the French Army,) and also conducts two sieges. More time is spent in camp (168 days) than marching (90 days) and one reason must be the greater level of control this affords, to keep an impressed and regulated soldiery from deserting. 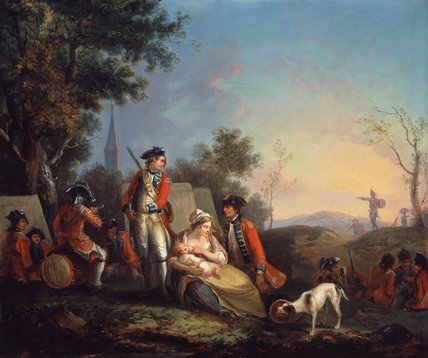 Even Frederick is not sufficiently active to keep his army maintained solely from foraging in the surrounding countryside. When looking at Napoleon's Grand Armee in 1812, there is obviously a considerable raising of the tempo of operations even though this was a campaign that was in part supplied from depots. The depots were assembled at Vilnius with Etappen (military roads) running back into Europe and the method of supply used was a wagon convoy forming a rolling magazine to accompany the army through the inhospitable countryside of Belorussia. There was considerable foraging over a wide area that left the countryside stripped bare for following, often Allied units. Looking at the period of advance to Moscow, again the marching speed remains much the same, however the French Army is now marching 4 days out of 7. This is an under estimate because when the pattern is looked at in detail, each Corps marches for best part of a month with only the shortest of pauses and then has a sustained halt at the end of a month with 4 days at Vilnius at end of June, 15 days at Vitebsk at the end of July, 7 days at Smolensk at the end of August and 22 days in Moscow at the end of September. This level of activity is made possible by spreading the army over the landscape in Corps, having nationally motivated soldiers who can be allowed forage, issuing the men greatcoats instead of tents, reducing the baggage allowance and supply train down to 12.5 wagons per 1,000 men and doing away with field ovens for baking loaves. With the tempo of operations raised threefold since the War of the Spanish Succession, the countries a facing Napoleon were given no choice but to adopt similar methods in 1813-15 if they were to come close to matching the speed of French manoeuvre. The one exception, Wellington's Army in the Peninsula, continued to use a traditional magazine supply method to combat the very low level of population/sustenance along the Spanish-Portuguese border. Yet even here, mobility was increased by the adoption of greatcoats instead of tents, shedding baggage wagons and shipping lighter biscuits from the rear in place of field ovens.